Great Blue Heron are a bird that survives in urban and wilderness areas. They eat frogs, small rodents, fish, crabs, and more. They nest in colonies or rookeries that can be home to a hundred or more birds. These herons are majestic in their demeanor, territorial while hunting, and tolerant during nesting. 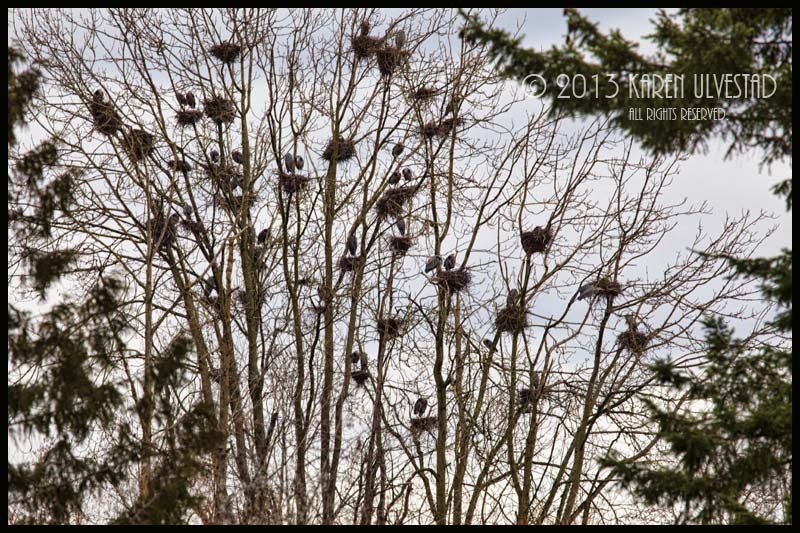 The photo below is taken at an urban area rookery that sits near Lake Washington in Kenmore. The photo below shows the entire rookery. 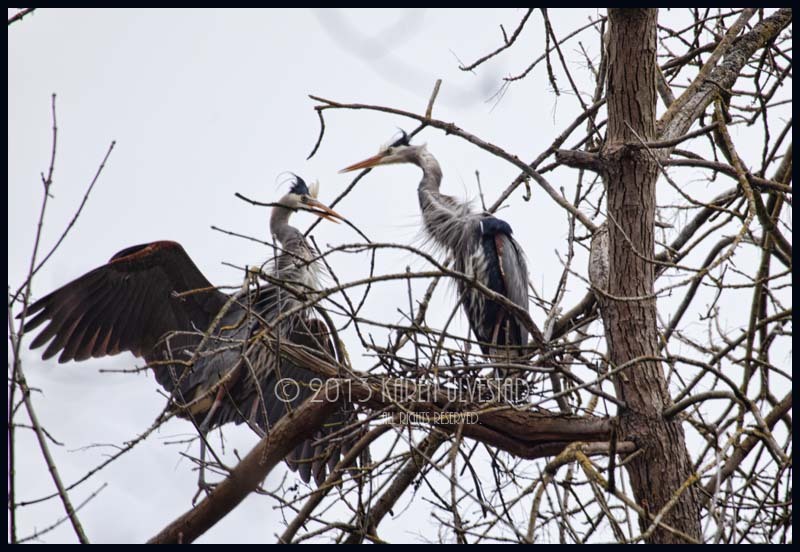 Currently, there are about 50 +/- nests in the trees, and 100+/- Great Blue Herons. It’s quite a sight, though challenging to photograph. 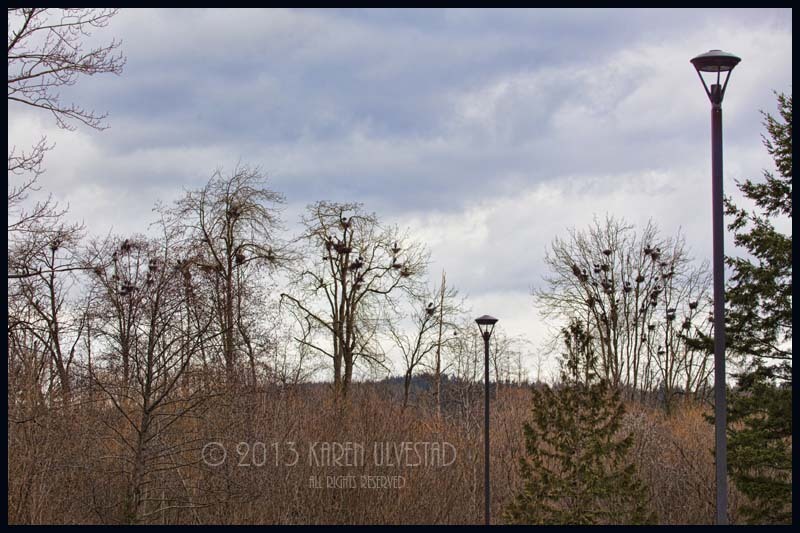 The wetlands are fenced off, so photography happens from the park-n-ride parking lot, or along the back entrance. The photo below shows the nesting pairs and their nests. Often, there are single birds vying for the attentions of another bird, or pairs looking for a nesting site. I counted about 28-30 nests in this tree alone. Surprisingly, the colony is relatively quiet. These photos were taken at mid-day, and fortunately, there were interesting clouds in the sky for the background. I’ve photographed this rookery before, I had the fortune of stormy weather and a rainbow. Tip: Aperture is important while shooting a Rookery. Most of these images were shot with f5.6-f8. This next image is of a nesting pair building their nest. He is bringing sticks, and she is placing them into the nest. I watched him bring one stick at a time, watch her place it in the nest, and he would preen her feathers during the process. It’s a difficult area to photograph the herons flying into their nesting sites, so scouting the location and planning is a good idea. Tip: Over-expose the photos, so the details of the birds show in the photographs. Otherwise, the birds will silhouette against the sky. So, I’ll leave with one last photo. 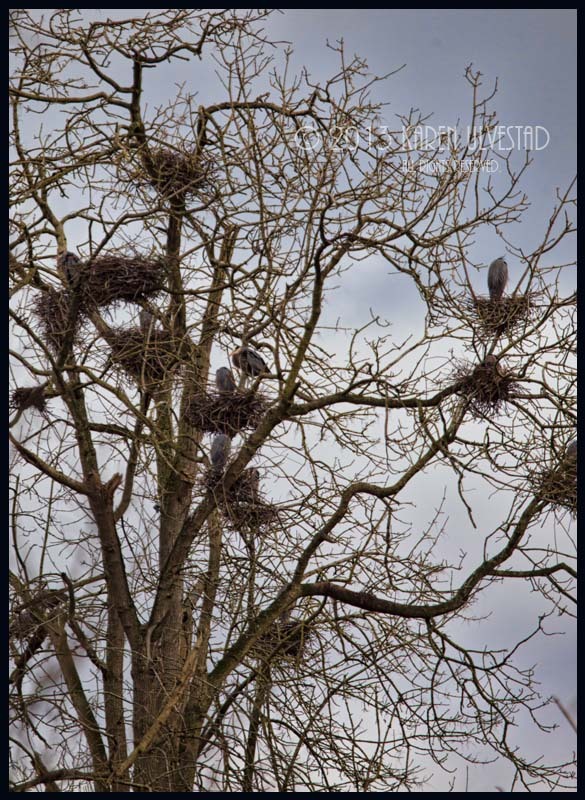 This is a closer view of several nests and herons in the rookery. The Bald Eagles will hunt for un-attended chicks later in the year.